From Spaetzle to Samosas: One of my favorite Kitchen tools - the Misto! One of my favorite Kitchen tools - the Misto! I bought a Misto roughly 4 months or so ago and it's become one of my favorite kitchen implements. It is a stainless steel canister with a built-in, easy to prime, pump that you can fill with a bit of your favorite oil. a) It was inexpensive. I paid roughly $10 for it. b) No propellants or additives to my sprayed oil. c) Because of point 'b' my pans, etc no longer have gummy, sticky, impossible to clean, gunk on them. d) Because of point 'b' I don't have to wonder what I am inhaling when I use the spray and what I am feeding my family. e) More economical than regular cooking sprays in the long run. Well, only one thing really. I wish it came in different colors because I would love to buy one for other oils that I use. With only one color canister I would get confused and use the wrong oils for my foods if I can't see at a glance which oil I am using. 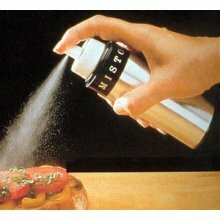 Spray my cooking grates, pans, meats and vegetables, pasta, fish, etc. with Extra Virgin Olive Oil. This sounds awesome! I would be much happier using this than PAM! But here is my one good excuse; dh is French. They don't have Pam in France, so I've never been allowed to use it here, lol! We use paper towels or oranges to spread oil. I was out of both. Can you find these in stores or only online? Sorry for the late reply. For some reason I can't leave a reply-comment on my blog. It makes me anonymous for some reason. These gadgets can be found on-line and at bed bath beyond. Yeah, it worked. I have to use my iPad to leave a comment. Go figure.